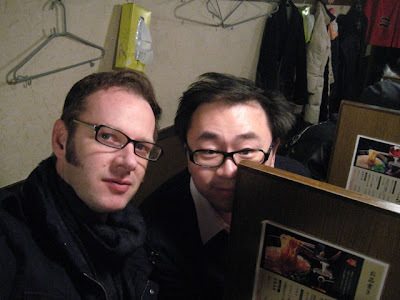 I last met my friend Emil in Tokyo on 15th February 2008, when he was making a visa run from Seoul were he lived. I'd arranged to meet him outside the Starbucks at Scramble Crossing in front of Shibuya station. I remember spotting him in the crowd giving me a wave and a smile as he crossed the road. He was wearing jeans and a black V-necked sweater over a white collared shirt. His hair was longer than it had been when we knew each in Sydney. But that had been several years before. It was great to see him and we gave each other a big hug. I remember he told me he'd been making trips to update his visa every three months for the many years he'd been living in Seoul. I thought that showed how determined he was to keep working there as an artist. He said he usually went to Hong Kong but had left it too late this time and could only get a ticket to Tokyo. I'm glad he did, because I got to see him. He laughed and told me he reckoned the customs guys in Seoul never gave him a hard time because they thought he was a second generation Korean who kept coming back to visit his relatives. He wasn't. He was Malaysian. I think we once talked about how I lived in Malaysia as a kid. I wish I could remember more about that conversation, I think he knew the school I went to, but that may have been someone else. When we met in Tokyo he was determined to go to a ramen (noodle) restaurant he had read about on the web. It was late and I remember standing with him outside the closed Apple store in Shibuya, he was able to get WiFi on his iPhone and looked up the address on Google maps. It was just down the street, Ichi-Ban Ramen, I think it's called. I'd never heard of the place even though I live here. Each person sits in a private, box-like cubicle and orders their noodles anonymously. The servers are hidden behind curtains. It was typical of Emil to track something fun like that down and share it. We leant out from our cubicles and between slurps of ramen and sips of beer we spoke of the things we'd been doing over the years. His work as an artist and lecturer sounded fascinating, and I swore I would go visit him in Seoul. I remember after we ate ramen we headed to Combine in Naka Meguro where we met a few people I know for drinks. I wish I could remember more, but the evening kind of fades into the distance after that. I'm sure Emil would have remembered. I wish I could ask him. Sadly Emil died the other day in Seoul. Much too young and much too soon. As a mutual friend said, Emil was a doer. I hope that is something I can learn from him. Rest in Peace Emil, I will miss you.